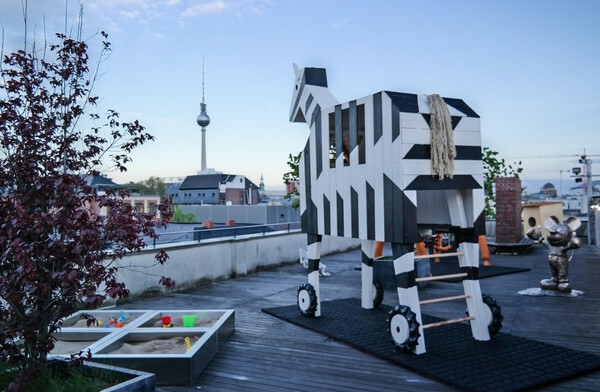 Michael Fuchs Galerie opened the “Rooftop Playground”, an exhibition featuring interactive and playful art works dedicated to children as well as adults. 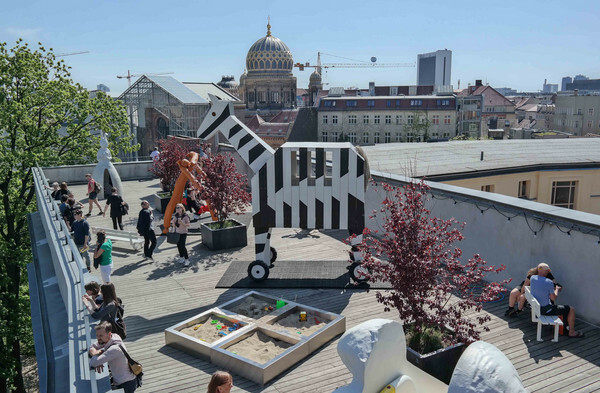 Located on the rooftop ot the Ehemilge Jüdische Mädchenschule, former school for Jewish girls in Berlin’s Mitte, the outdoor show includes monumentale sculptures and art installations by Tomi Ungerer (zebra striped Trojan horse), Johannes Albers, Olivia Berckemeyer (bronze Mickey Mouse), Jeppe Hein, Paul Hosking, Leiko Ikemura (ceramic rabbit), Christian Jankowski, Gabriel Rico (sausage swing), Tomi Ungerer and Felice Varini. Don’t forget a spectacular view of the city.